Mega Bloks Call of Duty RIB Beach Assault set review! Another of the new Mega Bloks CoD sets, quite a bit smaller than the last. This one is not my favorite of the lot. In fact, it's my least favorite. Even at that, it's still not a bad set. 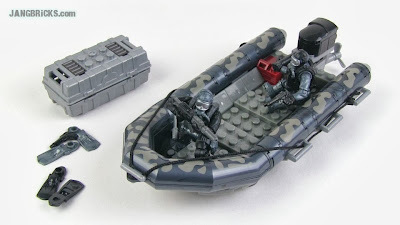 Video: Mega Bloks Call of Duty RIB Beach Assault set review! I have a question for you that I hope you can answer for me. Are you able to take out the breathing piece from the head or are you stuck with the tubes dangling down? I don't have the set yet, but I am wondering about that.